This behemoth of a burger will have jaws dropping. It’s packed full of 100% Prime Irish Beef. 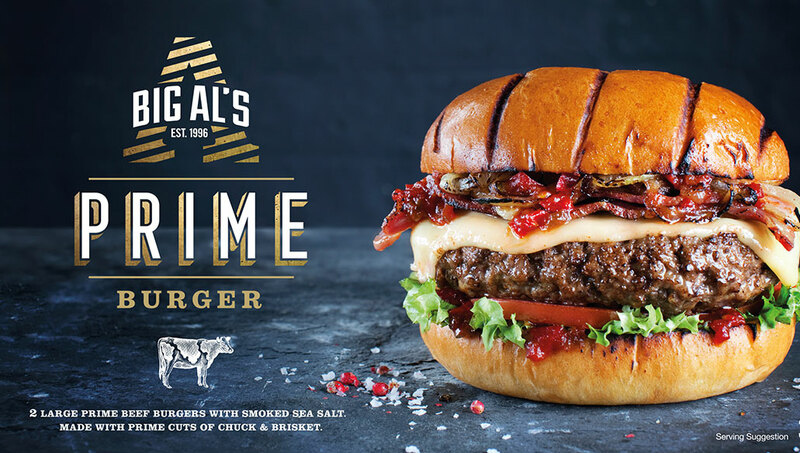 Beef that’s been raised right, grass-fed in Ireland and sourced from farmers we, at Big Al’s, know and trust. The meat is tender, juicy and full of flavour because we grind it fresh and use chuck and brisket – the prime cuts of beef that unlock the best burger action. For best results cook from frozen. Appliances may vary, the following are guidelines only. Adjust times to suit your appliance. Remove all packaging before cooking. Cook product to a core temperature of 75°C. Add a teaspoon of oil to a frying pan and fry over a medium heat for 18 – 20min, drain well before serving. Ensure product is piping hot throughout before serving. Place under preheat medium grill and cook approximately 18-20 minutes. Ensure product is piping hot throughout before serving. The Prime Burger is tasty, charred and smokin’ topped with BBQ sauce, onion rings, lettuce, mayo and pickles all stacked high and mighty, topped with a seeded brioche bun.